A stream of shimmering sunlight hits the Vltava River running through the center of Prague. Reflections of medieval buildings shimmer along the riverbank on the new town side of the city. 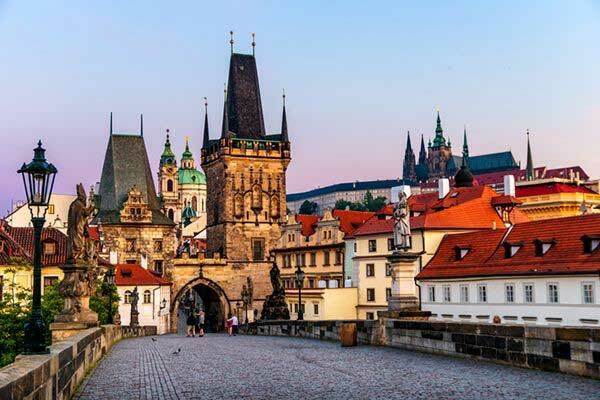 There are 17 bridges in Prague and the pedestrian Charles Bridge is the most famous and popular. One of our ‘roving retiree’ adventures was to spend a month in the Czech Republic. Prague was our starting and ending point. We travelled the length and breadth of this small European country enjoying local cuisine, spas, fairy-tale castles, and its picture-perfect landscapes. 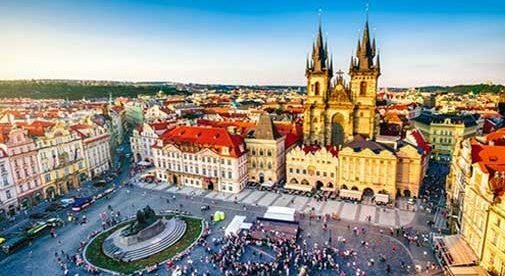 According to The Guinness Book of Records, Prague Castle is the largest castle complex in the world measuring over 229,000 square feet. The Castle dominates the skyline of Prague; you cannot miss its grandeur from afar. The views are spectacular from its fortified walls and landscaped gardens. Our travel tip for Prague is to book the hop-on, hop-off bus for two days, which includes a free walking tour of the Castle (with tips) and a one-hour boat ride on the Vltava River. You can purchase tickets online for approximately $31.40 per person. There are 280 museums in Prague. Some are quite unusual such as toilets, beer, and gingerbread. Whatever you are interested in there will be a museum for you.